At Innovation Montessori Ocoee, we launched our first public Montessori High School program. This game-changing educational experience is designed to create independent, inspired, and innovative students who have the tools to create their own futures. The three “I’s” are the pillars that drive the curriculum and approach to the education. The Innovation Montessori high school model was developed over six years, based on research into high school best practices, deep dives into Montessori philosophy, and what the future of the world and work might look like. Montessori students are guided from a young age to take ownership of their work and to learn for the love of learning and exploration, not for the “candy” of extrinsic reward. Gold stars and competitive charts aren’t plastered on walls, nor is the child learning in order to score on a test and move along. As students grow up and mature, the methodology for creating intrinsic motivation needs to evolve. One of the foundational books used in creating the IMHS charter, Daniel Pink’s, Drive, delves into intrinsic motivation for adults. Daniel Pink gives us three key components to creating the drive to learn and achieve: purpose, autonomy and mastery. We looked through this lens at how adolescents, who are quickly growing into adulthood, need to best be supported in dialing into their own intrinsic motivation in the educational setting. Purpose thrives in K-8 classrooms at Innovation Montessori Ocoee, with 90% of students responding in a UCF study on our educational culture that they are learning in order to help other people. They understand what many adults do not. They understand there is a purpose to the information they are receiving, and they can be agents of change. To bring this purpose-filled mindset into the high school, additional approaches are being utilized. One approach is mindfulness. Every morning, students enter a quiet space and have the choice to engage with our trained mindfulness coach, or to do mindfulness work of their own. Meditation, mandala coloring, yoga, breathing exercises, thoughtful reflections, guided meditations, calming music, and other techniques are introduced. Students are taught to clear the clutter, so they can better hear their inner guide. This inner guide can help them discover their purpose and start to define their career paths. In the Innovation Incubator in the first term, our students engage in a critical and creative thinking seminar, Creative Key, which threads intent and purpose into each week with challenges and questions designed to allow students to contemplate their present and future opportunity to affect real and lasting change in the world. As a true Montessori school, our Project-Based-Learning modules connect the work through a global lens. Dedicated time is spent learning peaceful resolutions and more effective reflection techniques, which again allow our students to connect to that purpose, which is critical for their long-term college and career success. 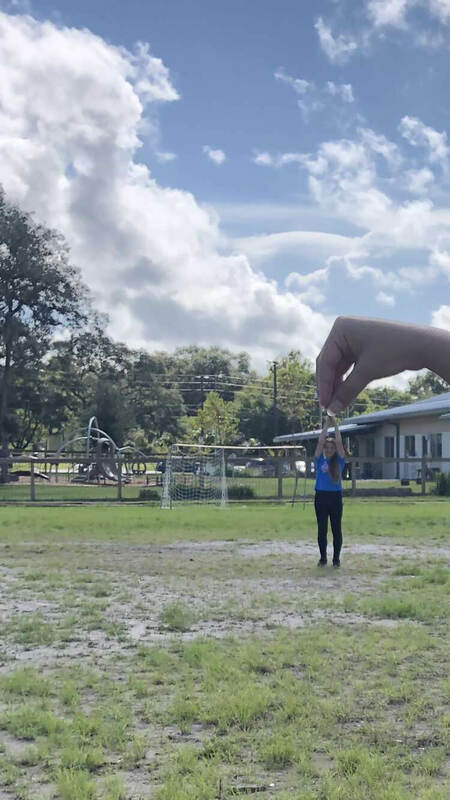 During their Innovation Incubator time, the high schoolers participated in a Forced Perspective photography exercise as a hands-on way to understand the power of perspective. Lexi Wheeler is featured. Autonomy is executed in large and small ways at Innovation Montessori High School. The students choose not to wear uniforms. They are given OCPS’s guidelines, but they are given the freedom to choose their attire. This small nod to autonomy builds trust with the students by treating them as young adults. It can also create challenges if the teenagers were to turn to divisive or derisive comments about attire. In our school culture, this is an opportunity for growth, not something to brush under the rug or hide from addressing. When these students engage with the world, they will encounter similar difficulties, and we are educating the whole child. We address challenging times head-on by using Restorative Justice practices. This creates a deeper level of social and emotional intelligence, and it also fosters an understanding that they have the choice to control their own thoughts, words, actions, and reactions, which is key to autonomy. Providing students choice is the Montessori Method, and this is never more present than in our high school. Not only were the rooms set up with modular furniture, yoga balls, rugs, and comfy couches for the students to make choices about what is the most physically comfortable way to study and learn, but they were also minimally decorated and outfitted. This intentionally created an environment for the students to prepare for themselves, which takes the “prepared environment” approach we use in our younger classrooms and flips it into the hands of the older students to execute, further rooting autonomy into the educational approach. Pink’s third support for creating intrinsic motivation is Mastery. ““The joy is in the pursuit more than the realization.” – Daniel Pink If students of any age are able to work at mastering a complex subject, task, or skill that they are engaged in, they are much more likely to be motivated to keep on learning. This mastery at Innovation Montessori High School manifests in the projects they tackle and the content they are exposed to in the curriculum. By utilizing project-based-learning, students achieve mastery through the work, which engages and deepens the understanding of the content. Project-Based Learning is the most effective of all types of education at this level, and the checkboxes of standards do provide a framework for the work, but the learning outcomes students take away root much deeper. Consider when you have to physically execute a task, how much more real it becomes. If you read a recipe, look at a picture, and imagine the experience of baking cookies, that can only take you so far. You can answer a standardized question about the ratio of butter to vanilla, and you can probably recite the steps and have a basic understanding of the “why” behind the order of the recipe. However, it is when you actually start to bake those cookies, you are on the path to mastery. Why? True knowledge comes from doing, and it comes from the subtle variations and changes you make to improve a process. It comes from the whole experience of physically stirring, smelling, tasting, and even from burning your hand on the pan when the cookies come out of the oven. It comes from testing-and-adjusting, so you grow and learn how to adapt the recipe for your particular water quality, elevation, pan, oven, etc. Putting the recipe in action allows you to literally get your hands dirty. By “doing,” you remember more, and you can transfer that knowledge to so many other applications (the ability to transfer knowledge is one of the most critically sought-after quality of new college graduates). You also now understand the “why” behind the ratios and procedure because you experience it first-hand. You learn in a deeper way, which will stay with you long after a memorized fact disappears, and it will serve you in multiple ways. Pink’s Drive is a great resource for adults as well, and it will shed light on some of the underpinnings of our Montessori High School. Please take a look at this great RSA Animation summary of intrinsic motivation: https://www.pinterest.com/pin/206391595409221078/. In future posts in the High School section of the blog, we will share other resources we used in creating the model and how our school is executing it, what is being tested-and-adjusted, and how it is preparing students to be the architects of their own futures. Citations:  A team from UCF, led by Susan Kelly, Ed.D., Associate Director, Toni Jennings Exceptional Education Institute, completed a study on student satisfaction at IMO.